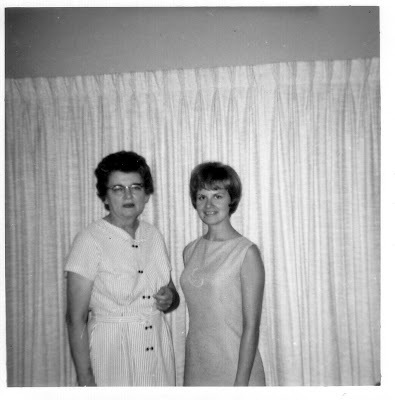 My dad’s mom is standing with my mom in this picture, sometime in the 60’s. My grandma knew that my mom was pregnant with me when she died, but she never got to see me. She died from breast cancer in 1968. While I was visiting with my mom this past weekend, she confessed to me that she still feels sad that Dad’s mom never knew his children. We feel like we know Grandma, however, from all the stories that Dad and his brothers and sisters tell. Here’s a fun story. During my grandmother’s last pregnancy, she sat down on a kitchen chair and fell to the floor. The chair had broken, and her husband and children couldn’t stop laughing. When she finally went into labor…she had two babies! My dad and uncle were born; one twin weighed eight pounds, the other nine! No wonder the chair had broken. My aunt says they felt a little guilty for laughing at their mother. Can you imagine what pregnancy was like back then? Not being able to see anything that's going on in there? Not knowing that you would have one or two babies or even three? All they could do was speculate! Give me today's technology any day!Recent blog post: Spin Cycle: It's A Date! You are nosy!! 😉 Yeah, there was no such thing as an ultrasound back then,although you would think maybe they would be able to hear two heartbeats. Iguess they missed that. My dad and uncle are fraternal. I always wantedtwins; I think I'm probably done having kids, though! what a great picture of your mom! she looks very jackie o-ish! that story about your grandma is so weird! i guess it wasn't that long ago before we could tell how many babies we were having – much less the gender! so are your dad and uncle identical? are you afraid you might have twins? or are you done? am i nosy or what? Recent blog post: FFF: Rock and Roll God!